Discussion in 'Casual Photo Conversations' started by federico|2, Jun 7, 2005. 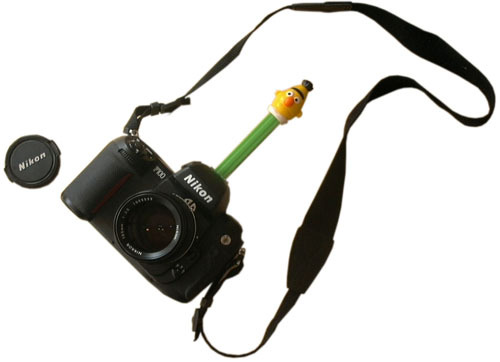 Tired of being unable to take good photos of your friends / kids? Here's my tutorial on how to create the cheapest and wackiest hot-shoe attachement for your camera. Now, using a cutter, trim the feet of the dispenser [fig. 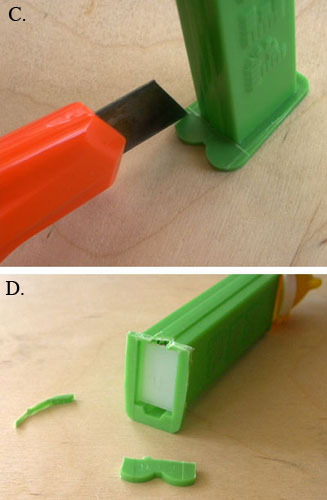 C.] leaving a 2-3 mm wide plastic strip on each side [fig. D.] Check the width of your camera's hot shoe if you are not sure. And avoid trimming your fingers. Now you are ready to shoot! The best use for this attachement is to make people laugh and quickly snap a joyful portrait of them. You can then reward them with a sweet for added happiness. I've tested it on kids and friends and it works most of the time! If you are not satisfied with the result, try using a different dispenser. The one you chose might not have been ridiculous / funny enough. Ottima idea, Federico. La provero` al piu` presto. What's the guide number on that thing? It sounds like a great idea for when you're shooting children. Sure to keep them interested and attentive, especially if you show them how it dispenses candy! Genius! Best tip of the month! what a cool, funny idea! I'm going to try it! Brilliant! Federico, you must be a kid at heart to have come up with an idea like this! This may be the best thread I've ever seen on photo.net. 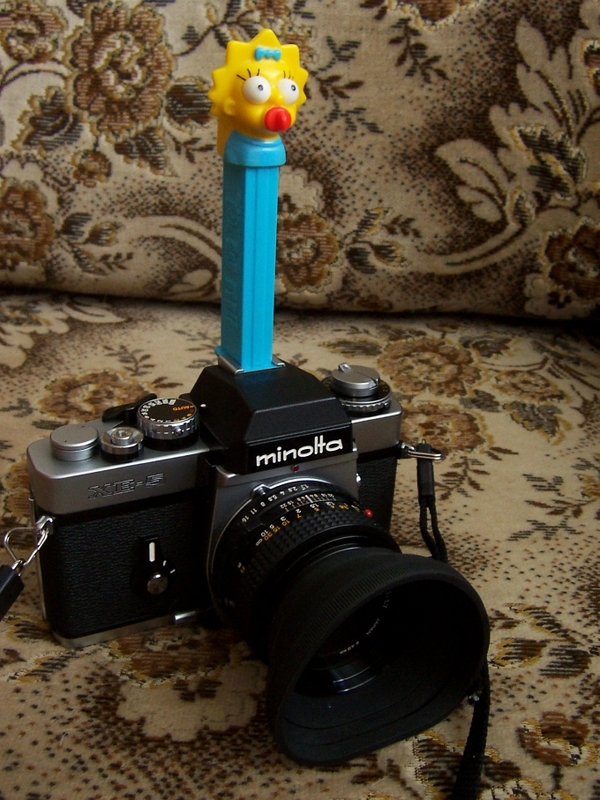 I must get someone to ship me a Pez dispenser so I can use it for street photography. It's about twenty times wackier than the smiley face and rainbow sticker on my camera. Ditto, Mike. This should be considered a must for street photographers. It'll put an end to threads like "I got beat up by an old lady because I took her photograph." Instead we'll have more threads like "I can't pick up chicks because they all laugh at my Pez dispenser." Now that's what I call thinking outside the box. Great idea. Hey could I get the Spec sheets on each? And which lens should I use with each, and wouldn't it be WAY Sharper on my M7?? Anyhoo great Idea for my wifes 3rd grade class, I'm seriously doing that the next time I'm there. 5. Light fall off/vignetting (better to measure the percent light fall off so that you can decide if it is digital compatible). 6. Others like coma, spherical aberrations. This list does not preclude the other factors essential to get an image that I can not think of at the moment or simply unaware that exists. P.S. If it is for anything related to Leica, add the "glow factor" as well. This can not be quantified, I think. My main problem is to find an unit associated to a numerical value for measuring bokeh. I've read all of Ansel Adams' books but he doesn't mention it :-( Can anyone help? Sorry, guy. You sure have been reading up on the wrong sorts of books! To get a "good bokeh", you need to stop down to at least f/256, I hear. Ansel Adams and his f/64 were waaay off. The fact that he never got to hear the word "bokeh" while he was alive did not help much either. Maybe in this case it should be, this is just too funny. 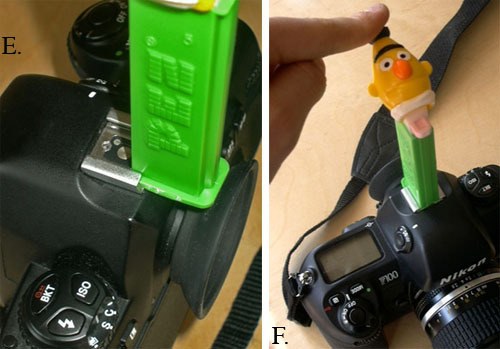 Which flavor Pez takes funnier pictures? 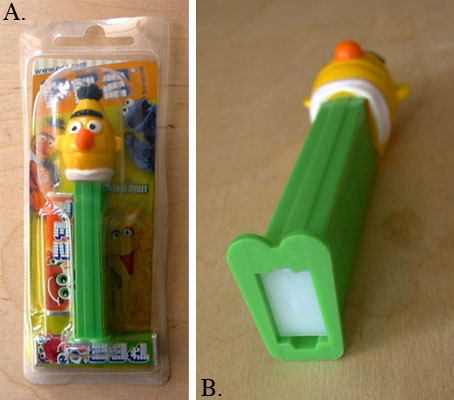 Can anyone direct me to at least a dozen websites that will help me with my hand-wringing despair over whether the Bert dispenser is better than the Patrick dispenser for street photography? I'm gonna go dig out my Dremel tool to make short work of refitting a dispenser for photo duty. I don't trust me with a sharp knife. 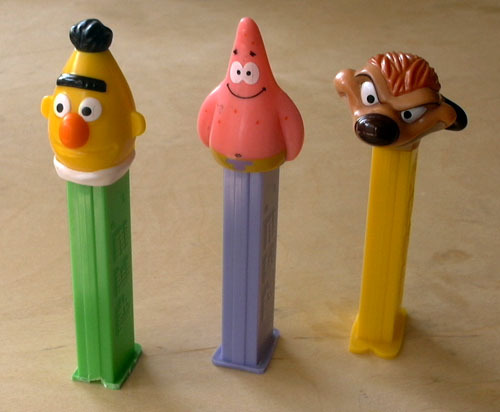 Don't these PEZ figures come in Black and White? I want the Trix monster! Hahahaha.....yeah you made this newbie's day too. Brilliant idea. Just bought a couple after seeing some post online (maybe this one?) Got a laught at a 4 year olds birthday party today. This is a great idea. Only problem is that you can't use the flash and I often use one in portraiture. To have both I'm going to stick one over my OCSC II. Hilarious! I blogged this with one of the images, if that's not OK, please let me know and I'll take it down. Nice work! ha ha. originally, that's for shure. Superb. Thanks for sharing your idea with us. It's a great idea . . . but using Bert as the test subject is a bit misguided. I mean, here's a guy who's famous for his paper clip collection! I'm pleased to see he has other friends . . . assuming the product still exists two years later. you have probably turned the City Fathers apoplectic with rage with this device...BRILLIANT!! And now for a range of similar attachments for other subjects, how about a clip-on "Oscar"
Superb. I was just looking for ideas to place over the camera lens and grab kids attention. The best pictures I've taken of children is when they are looking at an entertainer or a video that captures their attention. I just place myself as close to the TV or entertainer as possible. Yours is an excellent idea. Stupendously great idea! Thanks a lot!! Awesome idea. Anything that grabs the attention and focus of your subject and that is also small and handy and cheap is totally worth it. See if you find any value with a "birdie" from SmileForMeToys.com Thanks for the idea because it's great to find other things that make it fun to smile for the camera!